According to the Art & Finance Report by Deloitte & Art Tactic, confidence in the Art Fund Industry is mixed. “The majority of art professionals and collectors believe the art fund industry will expand in the next 2-3 years, but wealth managers are still very cautious.” Issues such as “Due Diligence Process for the Experienced Investor,” “Liquidity in the Art Market,” “Asset Pricing: Art,” “Track Record for Art Funds,” and “Unregulated Market” are listed among top concerns of wealth managers and have kept the industry in the boutique investment sector. This series of myth-busters will address the five issues and concerns mentioned above plus some more we believe are relevant: “Identifying the Risks”, “Sourcing the Right Experts,” “Arm’s-Length Transactions and Other Possible Conflicts of Interest,” and “Fiduciary Duty”. Along with the financial considerations, we will also publish the philosophical and intellectual counterpart in nine parallel articles. This part will deal with decoding the financial assertions into artistic terms. “Due Diligence Process for the Trained Eye,”“The Permanence of Art,”“The Aesthetic Experience as an Artistic Assesment,”“Art Throughout History,” “Art in Transit,” “Rediscovering the Value and Risk of Art,”“Exposing the Taste Makers,” “Conflicts of Interest: Chronicles of an Artwork,” and “The Universal Language of Art”. Our aim is to portray the possibilities of art-investment funds as institutionalized art-investment vehicles. Funds are an efficient, reliable and transparent one-stop-shop that benefit from economies of scale, portfolio optimization and the inefficient and unregulated art market. Investment funds like AGF have managed to securitize art efficiently through strict but practical operating mechanisms. It is our intention to promote transparency, credibility and efficiency in the art investment industry across our proven experience and we have the record to show it. 10-14-2015 Has the Art Market Entered a Bubble? 01-07-2016 Does the world needs to rise up against curators? 02-25-2016 Is the Masterpiece Market’s Appetite getting Smaller? In order to operate with more caution Artemundi Global Fund is continuously interested in analyzing the art market with our own means. Here are some free downloadable reports useful to anyone interested in the art market. The London auction season opened with a low-key yet reassuring result, as Christie’s “Impressionist and Modern Art” evening sale delivered £66,430,000. Small-scaled works seemed to be the flavor of the evening as Alberto Giacometti’s 11-inch high bronze Femme debout, from a posthumous 1976 cast, made £1,082,500, and the 16 by 13-inch Fernand Léger oil on canvas Le moteur, a mini tour-de-force from 1918, snared £5,234,500. The Contemporary art evening sale at Sotheby’s auction house realised a final total of £69,461,000 with a BI of 27% from the 59 artworks offered. The sale was led by Lucian Freud’s tender portrait of his lover Bernadine Coverley, pregnant at the time with their daughter Bella. The 1960-61 work was pursued by six bidders and sold for £16.1 million, more than £9 million above the pre-sale low estimate and a new record for an early painting by the artist. The Contemporary Art Day Auction at Sotheby’s totaled $98,025,250 with 80% of lots sold. The sale was led by Roy Lichtenstein’s Modern Painting with Yellow Interweave from 1967 which sold for $3.4 million, and Heat by Kenneth Noland, which set a new record for the artist at auction selling for $3.3 million. A Cy Twombly blackboard painting, Untitled (New York City), was the top lot in the Contemporary Art Evening Auction selling for $70.5 million, and is also the most expensive work sold at Sotheby’s worldwide in 2015. Sotheby’s Impressionist & Modern Art Day Sale on November 6th, 2015 featured a broad array of pictures, works on paper and sculpture by the leading artists of the late nineteenth and early twentieth centuries. Highlights included an oil portrait of a bather by Paul Cézanne which was once owned by Paul Signac, a 1906 Fauve picture by Raoul Dufy from a distinguished Asian collection, a monumental port scene by André Lhote from a private collection in Scandinavia, and an extremely rare and widely published oil by Heinrich Campendonk from the collection of Jules and Gladys Reiner. Alfred Taubman’s estate auction launched unsuccessfully last night. The eclectic collection once belonged to the magnate who resigned from his chairman’s role in 2000 amid a price-fixing scandal between Christie’s and Sotheby’s. . This precedent affected significantly the perceived value of the auctioned artworks, despite the fact that twelve pages of the catalogue tried to “clean” the moral character of the collectionist. The total amount sold in Post-War and Contemporary Auctions including the Italian Art sales was $336,378,719 USD, corresponding 41.4% to Christie’s, 41.3% Sotheby’s and 17.2% to Phillips. The auctions were held parallel to Art Frieze and Frieze Masters in London in mid October. The noteworthy results correspond to the Italian art sales held in both mayor auction houses, the total sold surpassed the total from the evening sales and many price records were established. These two sales added $129,313,364; a 17% increase from last October’s Italian Sale, indicating a growing demand for this specific art market. The total amount sold in Post-War and Contemporary Auctions was $2,060,717,775 USD; 42.4% above last May’s auctions and 40% above last November’s sales. This has been the highest total for an auction season in this art category. The result was 208% above the total achieved at the Impressionist and Modern Art sales. Christie’s sales accounted for 71% of the sales while Sotheby’s share was considerably lower at 23% and Phillips maintained its position with almost 6%. The outstanding result was due to the very high-end market, 23 lots were sold above 20 million dollars and 202 surpassed the million-dollar threshold. The total amount sold was $669,087,875 USD; 9.5% above last May’s auctions and 0.5% below last November’s sales. Despite being less than half of the Post-War and Contemporary Sales, the total achieved remained in the markets’ total average from the last couple of years. From this total, Sotheby’s sold 63% and Christie’s 37%. In general, the unsold rate of 23% was in line with the market’s average, in total 769 artworks were offered for sale and 590 found buyers. The total amount sold was $1,462,294,501 USD; 1% above last May’s auctions and 9.4% above last November’s sales. This has been the highest total for an auction season in this art category. The result was 117% above the total achieved last week at the Impressionist and Modern Art sales, these two art sectors seem to have a low correlation between each other. The total achieved was due to the very high-end market, 15 lots were sold above 20 million dollars and 177 surpassed the million-dollar threshold. The total amount sold was $672,569,188 USD; 10% above last May’s auctions and 4.8% above last November’s sales. Sotheby’s results more than doubled Christie’s results, because in general Christie’s lacked high quality inventory especially in the Evening sale. The total achieved was due to the very high-end market, 6 lots were sold above 20 million dollars and 84 surpassed the million-dollar threshold. On average the sale price at the Evening sales was $6,319,839 USD, 21% above last auction season’s average price. sales. Even though New York auctions continue to top the auction results from this sector of the art market, London’s market shows an increasing tendency when compared with previous year’s results. The total amount sold adds to $370,462,776 a result 7.4% below last June’s auctions and 12% below February’s sales; however, the UK auction results in October usually tend to be lowest of the year. Both Christie’s and Sotheby’s had a special sale devoted to Italian Art, the sale were characterized for top quality lots from modern Italian masters. During the past weeks an impressive total of 1,477,377,500 USD was sold during the Post-War and Contemporary. The total was 30% above last May’s auctions and 8% above last November’s. On the other hand, the total amount sold at the Impressionist and Modern Art sales was $611,222,125 USD; 34% above last May’s auctions and 4.7% below last November’s sales. The BI rate in both sectors was an average 20%, a low number for the market. Both Sotheby’s and Christie’s evening results represent the highest totals achieved at sales held in London in any category. The total amount sold during the Impressionist and Modern-Art auction week was $641,605,594 USD, 34% above last years February results. A total of $45,439,750 USD was sold during the Latin American Auction week, 1% below than last May’s sales and only 3% above last November’s results. In general the sales were focused on the lower-middle market, most transactions ranged between $10,000 and $50,000 dollars and only 5 lots achieved prices above a million dollars. The results indicate that the art demand continues to shift from Impressionist and Modern Art to Post-War and Contemporary. An impressive total of 1,337,313,150 USD was sold at the Post-War and Contemporary auctions (21% above last May’s auctions and 27% above last November’s), while Impressionist and Modern-Art sales totaled 641,572,000 USD (34% above last May’s auctions and 60% above last November’s). Reflecting the mood of the current contemporary art market, the auction were in line with their expected tendency. Relatively low Bought-In (BI) rates, new price records for emerging artists and a growing interest from young collectors. However, it was unusual for the auction season to find very few extraordinary or unique lots and most of the sales were dominated by artworks priced below $50,000 USD, even the average price at the Evening Sales was below a million dollars. The following two short reports analyze the most important results from the Impressionist & Modern and Post-War & Contemporary sales in London during June 2013. This report analyzes the results from the Impressionist & Modern and Post-War & Contemporary sales, 12 auctions from Sotheby’s, Christie’s and Phillips were analyzed, a total of $1,587,792,150 USD in art transactions. The purpose of this study is to give a very broad idea of the current state of two particular art markets: Impressionist and Modern Art, Post-War and Contemporary Art . 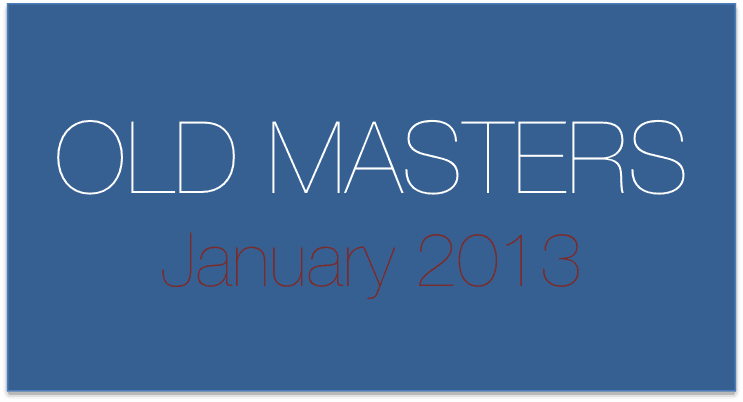 The following report analyzes the Old Master sales in New York. Although the general outcome was not bad, the results reflect a low market where high quality artworks are very scarce. The objective of this analysis is to study the current state of the Old Master’s Market by calculating statistical variables like: average prices, bought-in rates, price distributions, top lots, etc. The purpose of this study is to give a very broad idea of the current state of three particular art markets: Impressionist and Modern Art, Post-War and Contemporary Art and Latin-American Art. The total of the auctions studied account for $1,494,210,000 USD in sales and 2,293 lots offered. This analysis aims to study the current state of the Contemporary Art Market by calculating statistical variables like: average prices, bought-in rates, price distributions, top lots, etc. The results analyzed are from the Contemporary Art auctions in London and Hong Kong. Brief analysis from the Impressionist, Modern, Post-War and Contemporary Art auctions in London. Information about the record prices, top lots sold and price distributions. Brief analysis from the Impressionist, Modern, Post-War, Contemporary and Latin American Art auctions in New York and Mexico City. Market insight, top lots sold, general results and price distributions. Interesting current Art-Market facts and information about Artemundi Global Fund’s reasons to consider art an investment asset. This analysis aims to find the price range were most art transactions take place; in order to do this, price distributions from approximately 5,000 artworks sold at auctions were built. Frequently asked questions about the art market and art as an alternative investment. 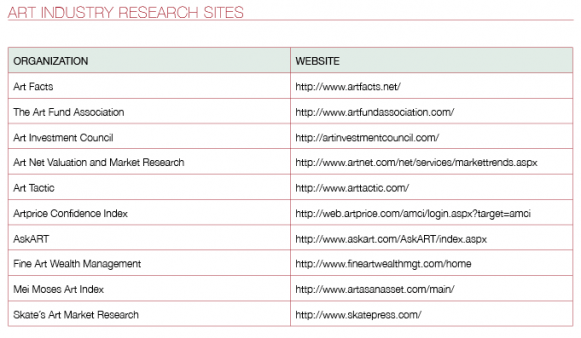 We recommend the following art-market analysis sites because of their serious approach to the industry. Not only have they become the information support for art-investment vehicles but they have also lead investors and collectors with confidence and assurance.